Place chicken pieces in a large skillet over medium heat; brown on both sides in two tablespoons of oil. Do this slowly to allow chicken to brown well. Set aside and keep warm. Dice the onion and peppers, place in a pot; sauté in a tablespoon of oil until translucent. Add the tomato sauce, chicken broth, bijol and chicken pieces, and cook over medium-low heat until the chicken is completely cooked through, about 1 hour. Serve cooked rice in a platter, pour the chicken stew over it and combine well. Arrange the chicken pieces. Add the peas and carrots. Serve. This chicken and rice will come out soggy, but you may add as much or as little broth as you wish. You may also bone the chicken before cooking it. I’m amazed to see the similarities we find in one same recipe that we consider traditional or native to our own country. “Arroz con Pollo” (chicken and rice) is the perfect example of what I just mentioned, a dish that is consumed in every Latin American home. And even though its preparation and presentation varies in every country, we all use common basic ingredients to give it that authentic taste and personal touch. 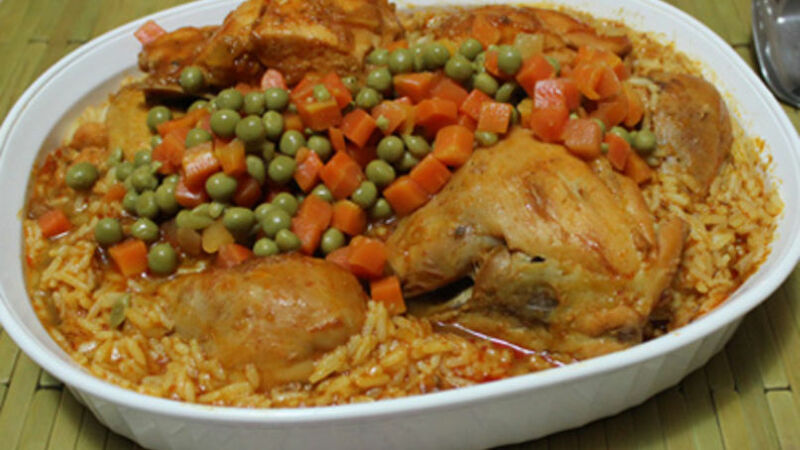 In my home, we usually prepare two delicious versions of arroz con pollo, the Puerto Rican one and this Argentinian recipe that I inherited from my beloved mother-in-law during one of my family trips.